First we will inspect your roof and identify any areas in need of repair. We will remove the excess mossy growth and lichen using special extendable trowels and hoes, and water fed poles. All our staff are trained, qualified, and insured, to work at height. Having removed up to 90% of the visible growth first we will then apply our softwash detergent blends to kill of the lingering spores and bacteria. We eliminate gloecapsa magma completely. Our blends of disinfectants will purge the roof of organic colonising growths by seeping into the moss root system and killing the spores, leaving the roof not only clean, but you’ll notice the improvements as time passes. We will also clean guttering and and shine your fascias while cleaning a roof. Sutton Driveway cleaning and softwashing will clean, rescue, and restore your roof, with no chance of damage- and the results will last for months and years to come. The culprit: Mosses feed on mineral salts that require light to grow. They typically consist of a green cushion of spiky tufts that may also be low and spreading. They are usually brown when dry. They are usually found on surfaces where salts, soil and dirt have accumulated, which is why they will commonly occur on roofing materials. Softwash roof cleaning offers a very thorough, deep clean. It won’t damage or dislodge roof tiles, or degrade even delicate stonework. It’s safe and effective. Roofs can become very unsightly due to organic growths like moss and lichen. Roofs are also frequently discoloured and stained by a prevalent bacteria called gloecapsa magma. Roofing associations and manufacturers do not recommend high pressure cleaning to clean roofs. 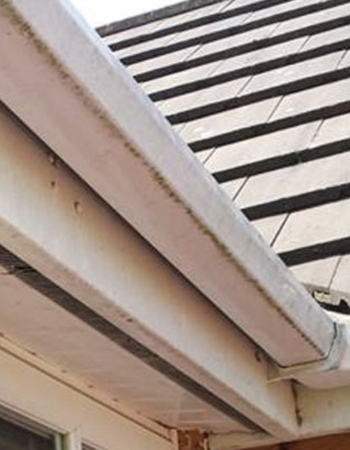 High pressure cleaning may remove moss from the roof, but the aggressive jets of water may remove and damage tiles and other roof fittings, risk flooding a loft, and there is a good chance that the moss will grow back. Cleaning with the manufacturer recommended detergent is suggested. This is what we do at Sutton Driveway cleaning and softwashing is by far the most effective way to clear moss or other infectants from the roof, whenever they are at risk of becoming a major problem. We serve commercial and residential customers in Sutton Coldfield and across Birmingham.